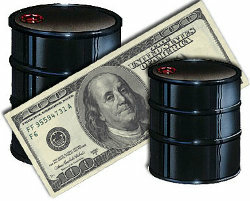 $100 per barrel: the line was finally crossed on January 2nd 2008. What does this imply for profits of oil producing nations? In order to run some numbers we have to consider a key measure called the break-even price which is the amount of money it takes to extract 1 barrel of oil. By dialing their target profitability first, oil companies then determine if a new drilling project is feasible. Needless to say, with oil retailing now at $100, more wells will be drilled in deeper, harder to reach places than were previously profitable. This level of profitability explains the recent $7.5 billion placement in troubled Citibank from the Abu Dhabi Investment Authority, the $1.8 billion investment in UBS by a strategic Middle East investor and the 20 percent acquisition of the London Stock Exchange by the tiny nation of Qatar. High oil prices have allowed Gulf Cooperation Council (GCC) countries to boost their foreign assets to more than one trillion dollars during the 2002-2006 period. With a looming recession (read "western assets on sale") and high oil prices we can expect this trend to increase.